Once in a while, a movie comes along, that touches your soul...Alpha does just that! FIVE PAWS! Every once in a while there comes a movie that tugs at your heartstrings and energizes your soul. Alpha is such a movie. 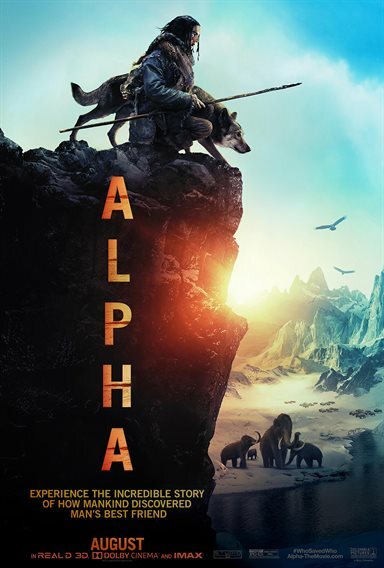 Directed by Albert Hughes (From Hell, Menace II Society) it tells a stunning tale of loss, friendship, and courage after a young boy Kodi Smit-McPhee (X-Men: Apocalypse) is left for dead by his tribe and has to find his way home with the help of a wolf named Alpha. Alpha is an epic adventure set in the last Ice Age in Europe, 20,000 years ago. While on his first hunt with his tribe's most elite group, a young man is injured and left for dead. Awakening to find himself broken and alone -- he must learn to survive and navigate the harsh and unforgiving wilderness. Reluctantly taming a lone wolf abandoned by its pack, the pair learns to rely on each other and become unlikely allies, enduring countless dangers and overwhelming odds in order to find their way home before the deadly winter arrives. Taking place 20,000 years ago was a real test on the actors in this film and doesn't seem as if it was a glamours job. The actors had to deal with what looks like real weather conditions, as well as some interesting moments crawling around in the dirt, and something else the might make a squeamish viewer advert their eyes. Aside from the amazing acting of Kodi (who basically carried most of the movie himself) along with his canine co-star Chuck, a Czechoslovakian wolfdog breed dog who stole most of the scenes, the acting of the rest of the cast led by Jóhannes Haukur Jóhannesson (Game of Thrones), Jens Hultén (Mission Impossible: Rogue Nation ), and Natassia Malthe (Elektra) hold their own as well when they are on screen. Slated for a September 2017 release, Alpha was pushed back to March 2018, then moved September 2018. Then it was moved yet again this time to land on its final release date August 17th, 2018. Now while these delays usually hint at a film that is in trouble, Alpha is far from that. It is instead a film that showcases how one can overcome the odds stacked against them and when all hope is lost, has the stuff "left in the basement" to carry on, find a friend and do the impossible. The directing by Albert Hughes is fantastic. The award-winning director has had the great skill of combining drama with action in the past and he continues to deliver this time. The cinematography by Martin Gschlacht (M for Murder) is amazing and showcases all the splendor and wonder of East Coulee, Alberta (the film's setting for Europe). I would not be surprised if he earns an Academy Award for this just like The Revenant did. The scenes of the harsh journey that Kodi and Alpha have to take are breathtaking and the world surrounding these too comes alive as well thanks to Gschlacht. While saying all that, the film is certainly not for everyone. There is not one line of English said through the runtime and to follow the film you need to read the subtitles. Also since about an hour of the movie is just Kodi and Alpha there isn't even much dialogue except when Kodi talks to his companion. The film also seems a lot longer than the 97-minute runtime but that is not a bad thing. You still do not want to miss a second of the amazing story. Alpha is a mixture of two types of films - one being a prehistoric one (10,000 B.C. ), and the second being a "boy and his dog (wolf)" movie (White Fang) and the result is simply inspiring. If you are a dog lover or just a lover of film in general Alpha is a slow burn but definitely worth it! Download Alpha from the iTunes Store in Digial HD. For more information about Alpha visit the FlickDirect Movie Database.